1 Universidad Autónoma de Bucaramanga (Bucaramanga-Santander, Colombia). gsepulveda169@unab.edu.co. 2 M.Sc. Universidad Autónoma de Bucaramanga (Bucaramanga-Santander, Colombia). ljaimes9@unab.edu.co. 3 Ph. D. Universidad Autónoma de Bucaramanga (Bucaramanga-Santander, Colombia). lpacheco560@unab.edu.co. 4 M. Sc. Universidad Autónoma de Bucaramanga (Bucaramanga-Santander, Colombia). cdiaz23@unab.edu.co. A utilização do biogás produzido em depósitos de lixo tem ganhado importância em países em via de desenvolvimento, como a Colômbia. Tendo em conta que este biogás tem propriedades pobres de combustão que dificultam o intercâmbio com outros combustíveis, a eliminação de gases e vapores, como o CO2 e o H2O, por meio de processos de purificação nos quais o biogás é convertido a biometano, melhora as propriedades do biogás como combustível para uso geral. Neste trabalho simulou-se a produção de biogás no depósito de lixo El Carrasco (Bucaramanga), usando o modelo de emissões de gases em depósitos da US EPA (United States Environmental Protection Agency). Adicionalmente, simulou-se o processo de purificação do biogás utilizando o software ProMax; o objetivo deste processo é extrair a humidade do biogás, para o qual utilizaram-se três aminas diferentes (MDEA, MEA e DEA) e um processo posterior de desidratação com glicol. Os resultados mostraram que a purificação com amina MEA logrou produzir o maior incremento na concentração de CH4 (90.37 %) no biogás gerado no depósito. Além disso, a desidratação com glicol foi um processo eficiente para obter gás com uma alta porcentagem de metano (91.47 %) e uma baixa porcentagem de água (1.27 %); estes resultados sugerem que o biometano poderia ser usado em processos industriais convencionais e em geração de energia. The necessity of using combustion technologies to reduce our dependence on fossil fuels and the emission of greenhouse gases to mitigate climate change [1,2] have encourage a continuous growth in the study of possible applications of alternative fuels, such as biogas. Biogas generated by the anaerobic decomposition of organic substances present in municipal solid waste can be a source of energy, especially in regions or countries where economic growth leads to an increase in the production of solid or organic waste from industrial and agricultural activities [3-8]. A variety of models can be used to estimate the generation of biogas with different degrees of certainty, depending on the composition of the matter disposed in the landfill [9,10]. Biogas is mainly composed of methane (CH4), carbon dioxide (CO2), and other small amounts of oxygen, nitrogen, volatile compounds and even hydrogen sulfide, which are generally cleaned off to reduce the harmful effects on combustion systems . The combustion properties of biogas, such as calorific value, flame temperature, and laminar flame speed are poor compared to conventional gaseous fuels such as natural gas or LPG [12-15]. Therefore, in order to use biogas in combustion systems, the design of the burners must be modified to avoid problems of flame instability associated with the lower rate of heat release, laminar flame speed, and change in flammability limits [16-18]. In order to improve the biogas combustion properties, it must be converted to biomethane by different treatments that reduce the CO2 content and its effects [19,20], in addition to other secondary compounds such as H2S [11,21,22]. A purification process used to remove CO2 and H2S uses aqueous solutions of amines in an absorption column; however, since this is a technology traditionally used to clean natural gas but not biogas, its application to biogas is still under study [23-25]. Generally, the purification process varies slightly depending on the gas to be treated (very acid or very sweet), and has three main processes: first, the deacidification that eliminates large percentages of H2S and CO2; second, the sweetening process, where sulfur from the previous extraction is recovered; and third, the glycol dehydration, in which a large amount of water present in the gas is removed [11,21,22,26-29]. Where M is the mass of the waste disposed at a specific time t, k is the biogas generation rate, which includes correction factors for methane, and L0 is the methane generation potential per unit of mass residue. The generation of biogas is assumed to decay exponentially, and reaches its maximum point after a period of time, prior to the generation of methane. For each unit of waste, after six months, the model assumes that the biogas generation decreases exponentially, as the organic fraction of the waste is consumed. The year of maximum biogas generation is normally estimated as the year of landfill closure. To conduct the simulation and apply the biogas generation model, we used data from the city of Bucaramanga (Table 1). 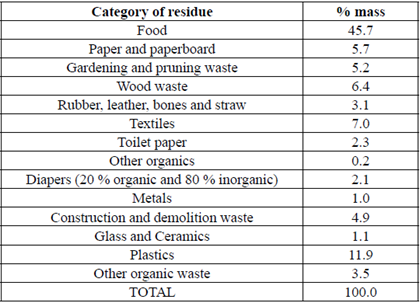 The waste composition was taken from the database that the used model has for each region (Table 2). These data were validated with documentation from the entities responsible for solid waste management in the city . 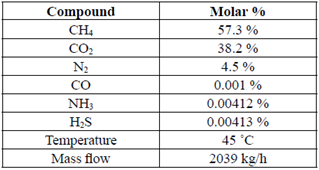 Table 3 presents the temperature, composition and mass flow of the obtained biogas, according to the model used. Once the biogas generation and composition were obtained, according to the model and the input data, the cleaning processes of the biogas were simulated using the PROMAX software. The thermodynamic properties were determined using the Peng-Robinson equation of state. Different amine deacidification processes were analyzed: Methyldiethanolamine (MDEA), Monoethanolamine (MEA), and Diethanolamine (DEA). These processes were chosen because the biogas obtained from a landfill lacks secondary or tertiary components of gaseous hydrocarbons , but it has high levels of carbon dioxide and may have carbon monoxide, sulfur hydrogen and ammonia. In order to obtain a "clean" gas, in which the undesired components have been removed, these three processes were simulated observing their behavior at cleaning the biogas. Given that the gas obtained from the cleaning processes is rich in CH4 and water, the sweet gas stream was taken to a dehydration unit with glycol to obtain a dry gas of better quality. The cleaning process starts when the biogas is introduced into the absorber tower, along with a stream of water and amine to obtain a stream of sweet gas and an acid gas mixed with the amine. This acid stream is heated in a heat exchanger up to about 100 °C, and then is carried through a stripper, where the acid is separated from the amine by the injection of steam. The upper acid stream is brought to a condenser, and the lower amine stream is brought to a reheater, where it is separated from the water. After passing through the heat exchanger, the amine is brought to a recycling and a makeup to finally raise its pressure to again be brought to the absorber tower. The scheme of the simulated processes, using the three amines to obtain the sweet gas, is presented in Fig. 1. The absorber tower has a 7-stage TSWEET Kinetics model, and the stripper tower has a 10-stage TSWEET alternate stripper model. We used a Boston-Britt model to calculate enthalpy. FIG. 1 Scheme of the simulated biogas sweetening process. For each simulated process, the presence of CO2 in the sweet gas and its charge in the rich and lean amine streams (Fig. 1), which is an indicator of the ease of amine regeneration, was established as a comparison parameter. Because there was a significant percentage of water in the treated gas, a glycol dehydration process was carried out, which allowed us to obtain a dry and better-quality biogas to use as an energy source. The CH4 rich gas stream obtained was brought to the dehydration process with triethylene glycol TEG. 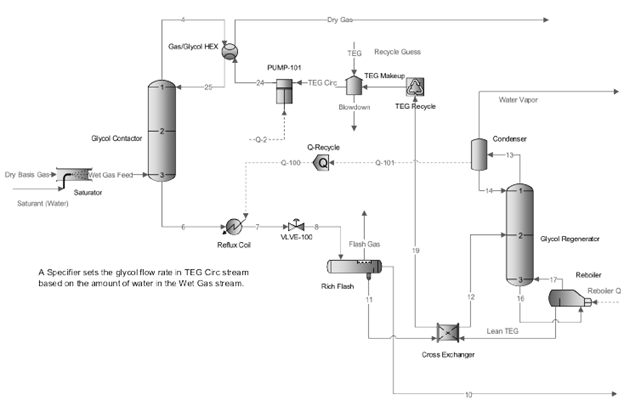 In this process, water and glycol stream are carried out through a heat exchanger, an expansion valve, a flash separator, and finally a TEG recycling process (Fig. 2). In the contactor tower and the glycol regenerative tower, a model for the Boston-Britt enthalpy calculation was used. FIG. 2 Dehydration process with TEG. By using the three amines, similar concentrations of CH4 were observed; however, with the MEA, a near total removal of CO2 was achieved, as well as a smaller amount of H2O (Table 4). Regarding the CO2 loads, with the secondary amine DEA, a higher load was obtained on the amine exiting the absorber tower (or rich amine), and a lower load was observed on the regenerated amine stream (or lean amine), although with a lower reaction kinetics, and therefore, affecting the absorption process and its regeneration (Table 5). In the case of the tertiary amine MDEA, the CO2 charge in the amine stream exiting the absorber tower was very low due to its even lower reaction kinetics , and the fact that it requires a greater amount of water for its activation (Table 5). These results agree with those presented in [23,34]. Taking into account the high percentage of CH4 obtained with the amine MEA, the CO2 loads in the rich and lean amine streams, and the lower presence of H2O in the sweet gas obtained, we decided to dehydrate the obtained gas with TEG. The goal was to obtain a drier landfill gas that would meet the different quality restrictions for use , such as a CH4 concentration greater than 90 %, a total concentration of gases (e.g., CO2, N2 and O2) below 10 %, and a concentration of H2O below 16 mg/m3. These requirements may vary according to the required application of the biomethane. The MEA cleaning process produced a gas with a calorific value significantly close to the calorific value of natural gas or LPG (Table 6). Likewise, the pressure uniformly dropped along the stages of the absorber tower, while a marked temperature gradient was observed in the lower stages of the tower generated by the contact between the incoming gas stream and the MEA stream (Table 7). The flow conditions and composition of the treated gas obtained in the MEA (Tables 4 and 7) cleaning process were taken as the input conditions for the TEG dehydration process. After running the dehydration process, the concentrations of the wet gas components increased, whereas the concentration of the amine MEA slightly decreased, due to its solubility in the TEG stream (Table 8). The TEG dehydration process resulted in a decrease of water concentration (1.27 %), consequently, this process produced a gas with low levels of both unwanted compounds (CO2, H2S, NH3, and CO) and water (Table 9); however, regarding the water, it was not possible to obtain a level that allows the introduction of biomethane into a natural gas distribution system. Nevertheless, the composition obtained here could be used in combustion processes at industrial level or for power generation without the need of introducing changes in the combustion systems to avoid flame instability issues, caused by the presence of CO2, or corrosion problems caused by the H2S. Four processes of biogas cleaning were simulated using the PROMAX software: deacidification with primary amines-MEA, secondary-DEA, tertiary-MDEA, and a process of dehydration with triethyleneglycol-TEG. Each deacidification process was carried out for the conditions of biogas generated in the landfill "El Carrasco" in Bucaramanga, Colombia. 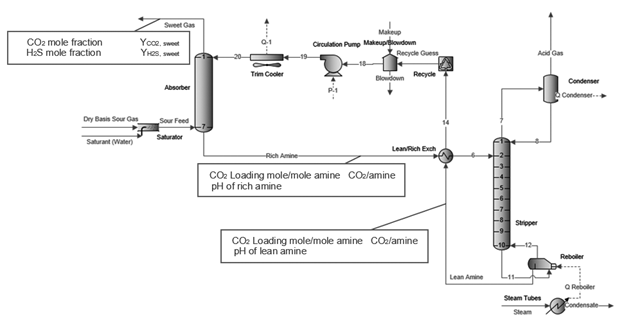 The results showed that the use of amines for biogas cleaning produces a significant enrichment of the landfill biogas, obtaining percentages of CH4 of up to 90 % from a biogas with 57.3 % CH4. Likewise, as this enrichment is obtained, mainly at the expense of CO2 removal, these processes may be suitable for the use of renewable sources of energy with lower emission rates of greenhouse gases. The dehydration process with TEG is necessary to remove the remaining water in the sweet gas generated by the amine regeneration processes. The sweetening processes increased the moisture content in the treated gas to 3.36 % with MDEA, 3.54 % with DEA and 2.48 % with MEA. These percentages of water can generate instability in the gas combustion, low flame temperature, or high dew point temperature values of the flue gases from thier combustion. The percentage of water (1.27 %) was similar to the humidity values normally found in the combustion of gases with atmospheric air, but did not reach a level similar to those required by some natural gas distribution regulations. This work is part of a research project on biogas cleaning for use in conventional combustion systems, and here, we presented only the results related to the increase of CH4 concentration. A parametric study of the processes in regard to the variations in the equipment design and operating conditions may alter the obtained results. The authors thank the Research Directorate of the Autonomous University of Bucaramanga for funding this project within the 2015-2016 biennial call for investigations.